I'm posting on the Sweet 'n Sassy blog today...hop on over and check out all of the details! Welcome to day three of eclectic Paperie's 12 Days of Christmas Celebration! WooHoo! It has been an exciting few days and I have been amazed by the beautiful projects posted by our design team...they are the BEST! And I'm thrilled to be sharing a handmade book project with you today, featuring today's product...Catherine Scanlon stamps! Catherine is an amazing artist and I was so excited when she launched her stamp and stencil line. 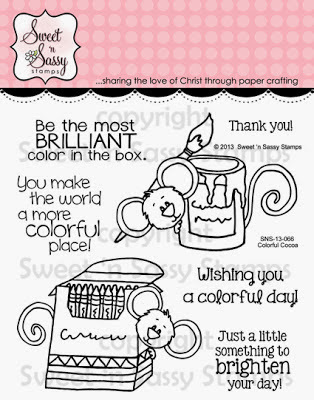 And today only, you can save 30% on one of Catherine's stamps, when you buy one at full price! Wow, great deal! I created a video for today's project, which will walk you through the steps needed to re-create a similar book. And you'll find links for all of the products that I used at the end of the post. I'm not going to post all of the photos here in the post as you'll see the completed project in the video. Enjoy! My cover featured this beautiful Black Eyed Susan image, drawn by Catherine. The sentiment is also from her new line. I used Art Anthology sprays to color the paper and a variety of stencils for decoration. Again, all product links at the end of the post. The inside cover featured an embossed piece of scrap paper that I had created for another project. The coloring was perfect for this product and I loved that there was also a gesso resist technique used on the scrap. Check out my gesso resist video for more details on that technique. I had the home card in my stash and added the rest of the sentiment using some tiny letter stamps. One of Catherine Twinchies stamps is above the card. I'm not the best at journaling, although I should try to do more as it's a great way to record your thoughts, but I love using quote stamps and this big long one from Tim was perfect to fill the page. I really like stamping directly onto a photo as well. Seriously, aren't these the moments that make the hard task of parenting all worth it. Just look at my crazy boys, wearing cardstock masks...and the look my youngest is giving my oldest is priceless. I adore this photo! The "so love these moments" stamp is from Ali Edwards. Another favorite photo...and a great sentiment, stamped in black, and more words above, which have been stenciled. And a big number eight to signify his age when this photo was taken. Sigh...that both of my kids would be fearless...not in a reckless way but in a way that keeps them doing what is right and pursuing their dreams. Inside back cover, with another piece of scrap paper, a card, sentiment, and part of a Twinchies image. And see my mess up date stamp? I even like that!! Embrace the imperfection!! Check out the full video below, along with all of the product links! Enjoy! PS - Just realized I have a typo in my video...saying today is the 12th instead of the 11th! Oopppss...it's late! LOL! It's the last day of the release celebration and we're kicking it off with a darling new Cocoa stamp set! Yippee!! This is the Colorful Cocoa set and I went colorful alright...Lots of fun colors in designer paper, a Copic colored box of crayons (and Cocoa, of course!) and the greatest sentiment, which I cut apart to fit in into the space I had available! Check out the entire set below! Paint can image measures approximately 2.5" x 2"
Be sure to leave a comment of each of the blogs along your journey because we're giving away (4) $15 store credits (1 winner will be chosen from each of the 4 blog hops). The deadline to comment for a chance to win is midnight EST Friday, December 13th. The list of winners will be announced on our website homepage by Monday, December 16th. Welcome to Day 3 of our release!! How about today's set...it's perfect for mixed media and card makers alike! When I first saw the set, I knew I wanted to create this type of look (and I think some other team members had the same idea! WooHoo!! Great minds think alike!). I simply used Distress Ink colors to create my rainbow and punched out my sentiment. You can see another card, using this Grunge Elements set, on yesterday's post. Look below for the entire set! 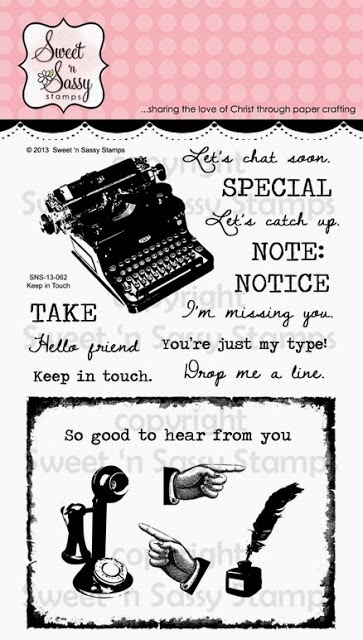 Word "art" measures approximately 1.5" x .75"
Let's see...typewriter font, grungey text, background stamp...yup, that checks all my fav boxes! Seriously, could this background stamp be any more amazing! I LOVE it to pieces! I actually created an ATC with the background stamp and combined it with tomorrow's release (ohhh...I'm such a tease!) and then decided that my ATC would look pretty fab on an all black background. The background was stamped on cream cardstock and then I added Distress Ink over the top for the blue background. Next came the splots...more about those tomorrow...and a die cut butterfly (from the Butterflies die set) from a scrap piece of gesso resist paper. I then added some bling and the sentiment before mounting the entire ATC on a standard size greeting card! This is one beautiful stamp...get it before its gone!! Measures approximately 3.75" x 3.75"
Welcome to the December Sweet 'n Sassy Release Celebration! Get ready to party because this month's release is amazing!! We're starting off the party with this great new set, Keep in Touch. I'm a sucker for anything vintage and this darling set, with the vintage typewriter and phone, along with the great sentiments and coordinating dies...it's just perfect! I created a sweet little card for this set, just 4" square, and layered all kind of goodies under the typewriter...distressed and embossed kraft cardstock, ticket stubs, washi tape, and a little tag that is just perfect for the sentiment. And, of course, my typewriter needed a typed note included!! Check out the full sets below! Typewriter image measures approximately 2.25" x 2"